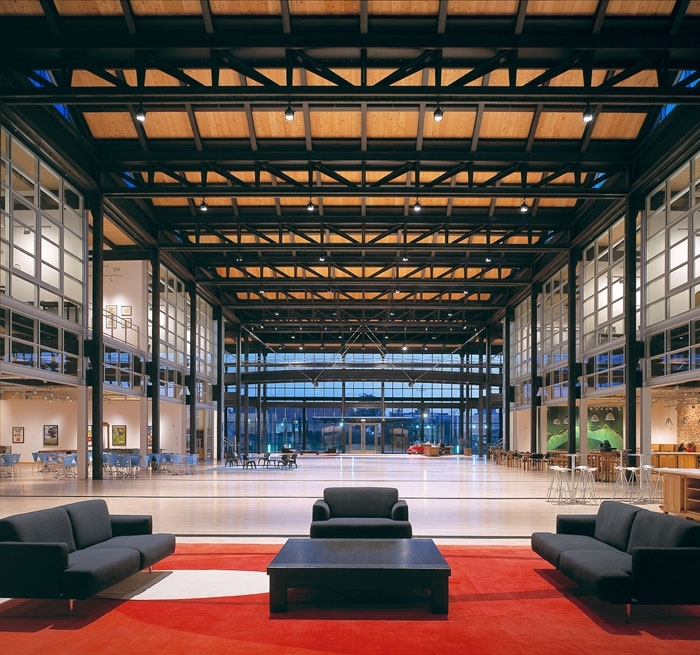 Sitting on the 15-acre Pixar Animation Studios campus, The Steve Jobs Building, designed to house Pixar artists, animators, computer scientists and administrators, is a two-story, steel and masonry facility housing 600 employees within a master plan for capacity expansion for more than 1,000 employees. 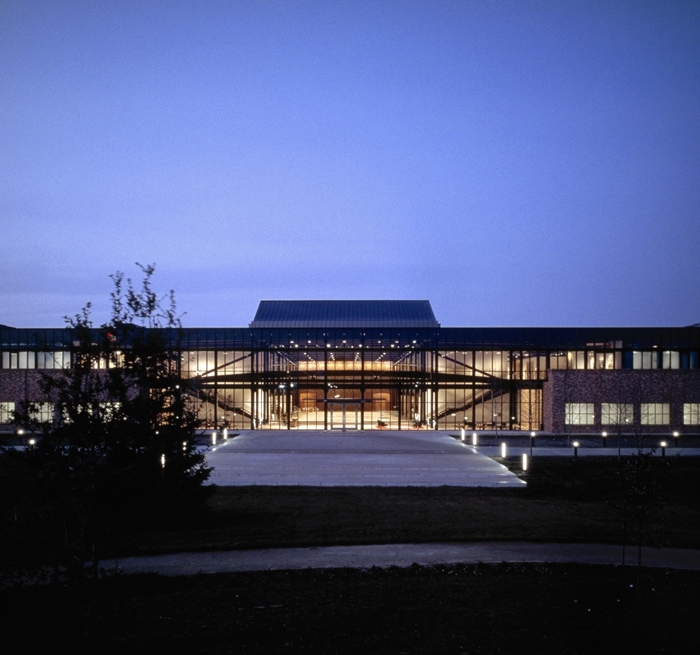 Auerbach Glasow worked closely with the design team, which included CEO Steve Jobs, providing architectural lighting design services for the project. The scope included 3 screening theatres, conference facilities, offices, café, lounge, central atrium, site and parking. This cutting edge building, intended to reflect a contemporary view of the industrial look, includes bead blasted steel, hand laid brick and exposed tongue and groove structural spruce deck. The specificity of these unique materials influenced the lighting selections, which were exposed and expressed as a part of the industrial aesthetic. The two-story day lit atrium, at the center of the building, contains steel floating bridges and stairs silhouetted against illuminated brick walls. 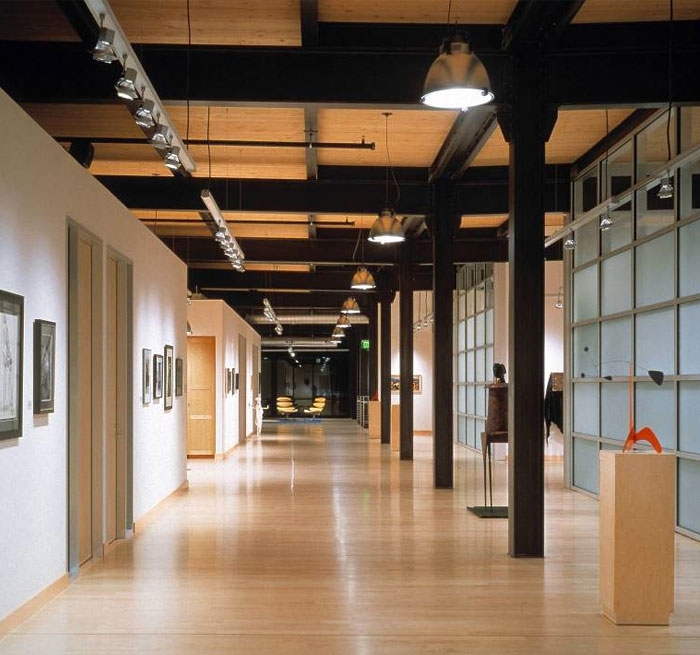 In the evening, truss mounted theatrical-type fixtures downlight the maple floor 30’ below. Restrictive penetration requirements of poured-in-place concrete above the exposed decking required exacting lighting placement during the design phases and precise execution during the construction phase. A flexible lighting system spotlights rotating artwork in the conference center while high efficiency fluorescent fixtures illuminate under-construction storyboards mounted throughout the office wings. The main screening theatre is equipped with a theatrical control system replete with a fiber optic star field. 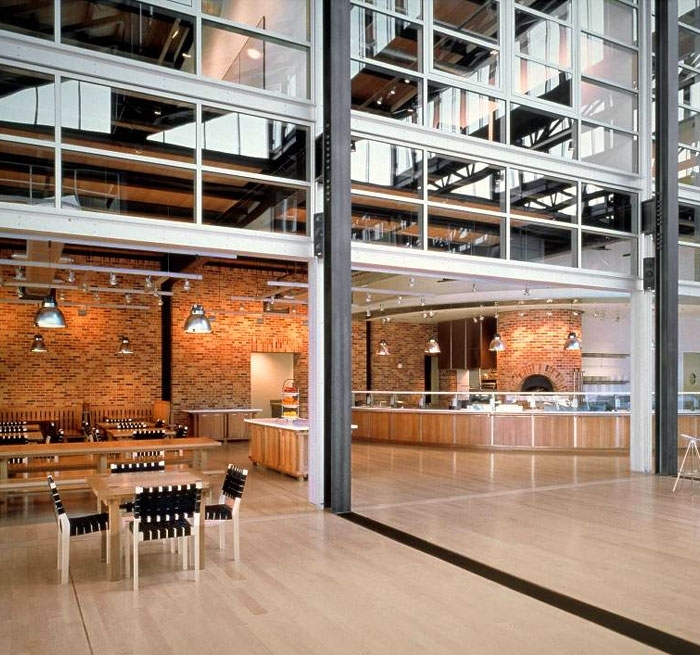 Auerbach Glasow also designed the lighting for the Pixar Brooklyn Building which opened in 2011.